Summertime and the weather is easy for working with an architectural color designer for your home's best look! This is a perfect palate to observe winter weather, keeping the room light and warm. Home improvements done right the first time! Or, maybe you've been free-wheeling your property's maintenance for years and need better results. Today's home owners find themselves in either situation. Then they take their list of problems and begin to look for ideas in design magazines and online platforms to solve each issue as money becomes available. What seems like a budget-wise approach to attack expensive repairs is the most costly road there is to property management and the result most often - a 'hodgepodge”. Step 1 - Look at your home critically and create a list of the things you love, and those you don't! What are the qualities of this residence that made you think you could live here? Inventory these characteristics which you want to show off along with the ones you'd like to lose. Then start asking your friends and family for names of professional designers who they know from experience can turn your ideas into a strategy. Step 2 - To prepare for a meeting with prospective design consultants, create a vision board; a collage of photographs collected from design projects you hope can be borrowed for success at your house. A file of images on your iPad, what Houzz.com calls an “ideabook”, can work too. Sit down and make a wish list, expressing, for your housemates and professionals alike, what you want to “see” happen with your home! Illustrate your aesthetic needs through images and your requests can be easily translated into three dimension - or nixed depending on reality. This is the part of the process where your mind's eye gets tested. We all have an imagination for visual outcomes, though the non-professional doesn't have the experience to know if their wishful thinking will work. It is not uncommon for homeowner's to mine contractor's off-the-cuff ideas, shared onsite during “free” consultations. Your property is too valuable to ad lib renovations and construction in this way. Architects and designers undergo rigorous training. They learn how to put their imagination to the test with finished results. The plan that you will design together is a road map and an insurance policy; it will clearly define the work for your builder and yourself (the DIY'er) and prevents repeated spending for construction materials and labor which fails to satisfy your list of wants and needs. Your contractor is the craftsmen who will build your dream. So listen to and heed their thoughts about the plan gained from their experience building and their detailed knowledge of the site. Step 3 - Have real expectations! I know what you're thinking – “Involving an architect, architectural color designer, or interior designer will just swell the cost of the project for this modest property.” No, not if you hire great professionals from referral, budget your requests, and direct their attention to the parts of the project you do not have the skill or time to do yourself. If you are clear about your skill set, your budget, and can accept a professional's considered advice, your collaboration can create a well-defined document for your project to be implemented over time economically. “Don't paint companies and roof shingle manufacturers have online tools to see how your home will look with different choices of color and design for free?” Often my clients comment that they know what they like when they see it; we all do. Unfortunately, the trial and error approach to building and renovation that many practice, is expensive. You are right to be hopeful that the internet graphics and design platforms provided by manufacturers might help you avoid the cost of a design fee. Manufacturer's design tools rely on digital photography that is not able to provide accurate color or contextual information critical to making good decisions for architectural design. Remind yourself of the inaccuracy of photos of family or from trips that you have shot yourself. Onsite demonstration with sample materials is the only well-founded predictor of design outcome. The sad fact is, the more you are unsatisfied with your choices, the more materials you will buy. If you've made some costly mistakes in the past shopping online or relying on advice at the paint store counter, seek the help of someone who does this as a profession, is not selling you anything, who will meet you on site and can give you the real context for the visual properties required to make a good decision. And be prepared to take the time that a light tested, site appropriate answer takes for great results. Step 4 - Assemble a team of designers who you feel have the skills you need to create a plan. An architect can make design, system and structural assessments and suggest changes to the building's envelope and the interior. An architectural color designer will look at the overall plan for the exterior and help determine the materials and colors that will define your architecture in its landscape. On the interior, color design adjusts light conditions and refines atmosphere for energy efficiency, comfort and style. Interior designers will work with you on floor plans, design built-ins and recommend furnishings that will make the best use of your space while adding your style. Some of these professionals have skills which overlap, but you can benefit from a collaborative approach by employing the best professional for the specific need. Trusting designers to create a plan for the vision you have for your home is a leap of faith. Hire only those individuals who have a portfolio of projects which match your sensibility so you are both speaking the same visual language right from the beginning. Design professionals are trained to take your ideas and turn them into plans. Share your budget limitations and your desire to do some of the work yourself. Your family's biggest investment will benefit from the time you devote to assembling a team to work with you. Home design done right using both professional help and DIY is a winning combination. The biggest value for your money in renovation and construction is design. So keep watching HGTV, pouring over magazines for inspiration or making image portfolios online - it's free to start the planning process. Then hire well-regarded design professionals to make site-specific drawings and schedules. You will be surprised how easy it is to make decisions that reflect your own ideas and then communicate them to your builder. Don't buy the illusion that suggests that you can shop your way to a fine finished home. And most importantly, the time-honored process of architectural design will translate into real property improvement worth your investment of time and money and will provide you with a home you will love. Want to be more creative at the office? Turn your workspace into a studio! Everyone knows the value of creativity and innovation for the success of a project. So how do you keep inventive ideas coming day-to-day? Ever notice studios are almost always a bright white? Not only does this color most dramatically amplify the natural light of a room, white is a cool color which helps with focus. If the space is poorly heated, add a touch of yellow to the paint and the positive feeling of sunlight will adjust for the low air temperature and encourage attention. With white walls and ceiling in place the visual artist, or creative wannabe, has a backdrop to see their work in stark relief. For those in product design, marketing, or working with equations, the white of a “blank canvas” signals the start to the creative process and is the perfect display space to keep work on view. Whiteboard paint (which turns any wall into a white board, floor to ceiling) facilitates the process of working out ideas on the walls of your space to be revised and improved throughout the day. Try Matisse's habit of putting recent or unfinished work where you can see it out of the corner of your eye. This technique lets your intuitive brain have a run at the problem. An indirect visual scan of a design can reveal what isn't working when you least expect it. Posting incomplete ideas on the walls also creates opportunity for colleagues to comment, which can be transformative. Just the act of explaining something that you are struggling with to the casual observer will catalyze your own thinking. Shared space or an open door encourages these informal critiques. There are many reasons nature needs to be a part of your office re-design to stimulate creative thinking. To begin with, nature has the best ideas! Many successful products were borrowed directly from nature – the sticky burr was the source for Velcro, to name one. Artists will adorn window ledges with found objects like shells, rocks and driftwood to enjoy and inspire. If your habit is using your smartphone to capture intriguing natural images, get them off the screen! Have them enlarged and made into prints and posters so they can be studied indirectly while you work. Fascination ignites constructive thinking. Start your daily cognitive workout looking at nature from images you have taken and “speak to you.” Photos are the first step of a creative process that will encourage more ideas. Your office may not overlook a scenic landscape, or anything remotely natural, but a glimpse of the sky can keep you in mind of weather, the time of day and the seasons - established rhythms of your local ecosystem. Remember how expansive your thinking gets when star gazing, moon watching or stepping out into a new snow? Wonder is a starting point for creativity, triggered by the awesomeness of the world outside the office. Inside, you can “host” nature when space or company policy allows. Fish, your family dog, even a plant will improve your office life. It is well known that contact with nature is calming and restorative. Flora and fauna that make up our world can provide respite during a busy day. Plants personify growth and positive energy while bringing the outdoors in. During the evening they have the added advantage of filtering the air. Some even add a forest scent that stimulates the senses and calms. Awards and trophies are nice reminders of success, but do they truly stimulate the memory of your accomplishments? It's easy for an artist or designer to pin up prototypes or finished images to illustrate successful solutions, but all jobs have important discoveries along the way that can be made into visual inspiration. If you are having trouble distilling your process for a wall display, ask the marketing department to help. Easily ordered and applied vinyl letters or numbers can show off your best quotes or mathematical solutions to encourage more of the same. Collections of objects that exercise your passions have a place in your studio too. Many artists collect the work of others in their field or a craft they admire. Borrowed ideas can kick-start your own unique perspective, initiating the process which then leads to original creations. Display the tools of your trade by keeping them on hand for use on a whim. If you are well trained to put things away, this practice might take some getting used to. Artists find inventive ways to keep colorful materials and favorite supplies in view; in jars, hung on the wall, or in open shelving. The added step to extract these tools out of a cupboard to begin a project can curtail an urge to play. It is well documented playful exploration is highly effective for solving problems and making headway when other approaches to the process fail. So take this suggestion as an opportunity to get messy! The successful strategy of curating your workspace for creativity requires furnishings be made less visible. When asked what color you want your desk, your file cabinet, your chair – white, white and white. Easy! Camouflage the things that will clutter your old/office, now/studio, freeing it from the frenetic to focus on the curious, the successful, the admirable and the outstanding. Consider your new studio space as a habitat and choose the elements that condition your work experience wisely. Artists have relied on these proven practices for centuries with the result of making the ordinary into art; transforming our world with their awesome creativity. Your instincts will respond in ways that might surprise you. When trading your office for a more inspiring environment, be prepared for a creative surge and the potential of elevating your work to an art form. Springtime home maintenance offers a new opportunity to add the color we crave. And picking the right colors for our homes is not magic. The process simply requires that we look at the physical qualities of our home’s architecture and apply color that will put the focus where we want it. Here’s how. Rather than worrying about style and the artful assembling of accessories, consider the structure of your house and make a color strategy that works for movement and creature comforts first. By taking a look at each room and asking yourself, “What do I want to see?” you can create a plan that puts the focus where it is most important and will lead those in your life to experience your home as you want them to. Start by touring your house the way your guests do. Drive up to your home, park, enter and try to see your home with fresh eyes. Make note of positive and negative attributes. Pay particular attention to the orientation of the house and the light that enters each room. Sometimes using a camera’s viewfinder can help you see your home’s true potential. Snap a picture of each room as you enter and from different angles as you peruse the space. The pictures will help you see what you are working with. Color is one of the most immediate and simplest ways to move walls and change the proportions of your house (visually, that is). But to make changes, you must understand the light that illuminates your living space and use it to accomplish your objectives. To offset the snow white of walls and trim, try a red or deep orange floor that expresses your home’s happy side. A warm floor color can impart the red light of the sun without shrinking the room. Keeping the flight path through your house free and clear includes diminishing harsh ceiling angles and edges. A grayed color on the walls and ceiling can unify shadows and take away the hard lines that come with the intersection of forms. Softening the angles with color can redirect the emphasis from the awkward to something else — say, a painting or series of family photographs. Streamlining architecture by minimizing color shifts works for all parts of the house. One client told me that she went to bed each night looking at icebergs overhead. Clearly the “ceiling white” used to color the series of odd triangular forms of her cathedral ceiling had created an ominous focus that kept her up at night. A quiet tone of a green-white on the ceiling and walls did away with the arctic landscape while bringing the attention to the soft furnishings that supported a sound sleep. Natural light is what we all crave in varying amounts. Decide how the light coming from windows and doors aids your use of each room, and at what point during the day. A sunny kitchen first thing in the morning is perfect for a busy family that wants to get up and meet the day. Want to amplify light? Use white and shiny surfaces that reflect. Want to cut back on glare? Window treatments are an easy fix, but consider that you may want to keep the view and subdue the impact of the reflective planes. Gray is a color solution for a room with a glare. If your room misses out on abundant sunlight, use color to create the illusion of it. A light sisal gold on the walls will create a cozy place in which to flop. Sometimes the house that you call home is as uncoordinated as a growing teenager. Additions built when space was in demand can confuse the overall design. Proportions in one part of the house may be different than those in another, which can make certain features stand out when you wish they’d recede. Doorways that are too large make others look small. The visual presence of architectural elements can be controlled by the value and intensity of their color. Want something to stand out and make an impression? Paint it the most saturated or contrasting color in the room. If you want something to go away, paint it the same color as its surroundings. Is something too large and imposing for your space? Choose a color that is dark and gray. Charcoal will shrink and set what was once a foreground element into the shadows. This living room design allows us to forget the structure of the sofa while still providing a warm seating area with a view. Repetition is an important element in good design and helpful for finding our way through a space. Establish a feature or material in your home that you want to have noticed, then use its color repeatedly throughout the floor plan. For example, the blue in the tile shown in this living room carries our attention through to the dining area. Creating visual pathways may not be your idea of a priority when designing your interior, but it is one of the strongest subliminal visual pursuits of your family and guests. Use color for visual touchstones, and your visitors will compliment you on your calm, beautiful home. If you're like me, your mood and motivation are elevated by sunshine. You can't always be out-of- doors enjoying the sun when you might like, but you can find ways to stimulate your body's upbeat response to natural light during your commute. Working, eating and sleeping are better when you get out in the sunshine for fifteen minutes each day. Sometimes it is just a matter of taking off your sunglasses while you walk or exposing a small area of skin while you wait for the train. Your office space may seem perfectly suited to your work requirements, but disrupted sleep patterns and low productivity may be telling you otherwise. Windows and site orientation determine when and where sunlight will grace your office. If you can, choose the location of your workspace by its window light. For example; If your energy lags in the afternoon (and you live in the northern hemisphere) that means you require a south/west facing exposure. Filtered sunlight from window - glass provides light and warmth that suggests the stimulating properties of sunshine, and therefore many of it's benefits. When focus is mandatory and your workspace does not offer natural light, pickup and move to a work area that does. Office window light is energizing, but the wrong interior color for walls and trim can work against a sunny outlook and focus. I once received a call for help from a business manager of a large Boston financial firm with a nautical name. Unfortunately for their employees, the interior designer had decided that the entire office would be painted blue to go with the theme of the corporate title. Even the carpet was blue which also, sadly, was the overall mood of the staff. “We're miserable and need your help”, was the plea from the woman responsible for morale. After an on-site review of the light conditions, the solution was easy. Shaded Low-E windows brought plenty of light into the office, but the blue gray of the walls and carpet further dampened the sunshine from the source. Just changing the walls and trim to an off-white with red/yellow undertones did the trick. Red, known for it's ability the raise a person's blood pressure and mood, was the tint I chose to replicate the warmth of sunshine that had been denied by the screened windows and the inability of the blue gray walls to bounce and amplify the light of the sun. That simple change prompted a follow- up call which began, “We are so happy here!” When happiness is up, so is productivity – and the bottom line. When natural light is not available, hang large images of sunny landscapes or abstract paintings of primary colors near your desk. Water views of tropical teal conjure memories of vacation and fun. Saturated color will convince you that sunlight is present, even though it is not. Using a full spectrum daylight desk lamp will trigger your brains' response to light, leading you to believe that you are bathed in sunshine whenever you choose. Not only will your paperwork be illuminated by a full color light source, those workers who are particularly sensitive to sunlight deficiency will perk-up, be happy and productive. Deep colors add height, white creates calm, and warm hues spark energy. Learn more ways to use floor color to enhance your home. Walls and trim are most often finished and maintained using paint, so they are the place where homeowners first see potential for personalizing their house with a new palette. But people often overlook their floors, the color of which can greatly influence your decor scheme. If you’re looking for a seismic shift in your interior design, or are just looking for smart ways to add height or create energy or calm, try one of these grounding color concepts. Successful architectural design always takes human scale into consideration. We want to fit the proportions of our home. Color can help adjust the visual perception of the height of a space, especially in areas of the house not part of the original floor plan, like a sleeping loft under the eaves. Want to drop the floor? Take a cue from your favorite swimming hole and saturate the surface with dark blues or blue greens. Visual distraction and clutter can take away from the calm you want in a room that will host music study, quiet contemplation or conversation. By selecting a white-finished floorboard, close in color to the walls, the perimeter of the room is diminished and the space opens up to present a feeling of stillness. In a small house, the floor is a good place to put saturated color. A hefty hue taken in from overhead is less dramatic than surrounding your peripheral vision with it. Strong color on walls will appear to come forward and diminish the space. When flooring is stained or painted an unusual color and used throughout the home, as with the teal in a contemporary, it becomes a neutral. It may seem counterintuitive, but the more you use an unexpected color, the less out of the ordinary it becomes. A warm hue, like citron on the floor, can raise the temperature and energy in a room where you want a positive vibe. This kind of bold flooring installation paired with a classic white kitchen radiates heat rather than cold. Like a landscape to be taken in and enjoyed, a well-thought-out interior of color and form can enhance the enjoyment of life at home. And the perfect rug can add interest and easily pull a room together. Using the floor for a bold color statement is particularly effective in a “destination” room where you’ve arrived to enjoy artwork and fine furniture with friends and family. A one-of-a-kind rug design with outstanding hues can become a color counterpoint that keeps the living room lively but visually balanced. Superimposing a large, organic pattern in white over a clear-coated hardwood floor can make a kitchen floor appear expansive. This bold use of contrast works best if the color palette is kept to a minimum to keep the design from overpowering the space and drawing all of the attention. A diagonal checkerboard is another visual trick to open up the space and give the room breadth. Painted, stretched canvas is an old-time floor covering popular before linoleum, with many of the advantages. Heavy canvas can be stretched, tacked to the perimeter and then painted or fashioned into a rug. Stair treads and risers are often overlooked as design elements. These can be wallpapered, painted in a rainbow of ascending color or pulled into the spotlight with saturated hues. The sweep of a simple handrail in an unexpected blue is enough to make a staircase a showstopper. Pale yellow decking of a side entrance welcomes with a sunny glow. This happy porch idea, must be selected to complement the purple gray or brown of the home’s exterior wall color to provide the optimum warmth to linger and send some sunshine through to the interior from the windows all year long. Color selections are best made quickly. Landscape painters know this because they learn that long deliberations only make colors appear the same. Science tells us that our visual receptors, rods and cones respond immediately to light waves reflected off surfaces, and the resulting signals travel swiftly to the brain. So why then do we hem and haw when trying to choose a kitchen floor or wall paint that could be just about any color that we can imagine? As an architectural color designer who is also a landscape painter, I guide clients to look at their homes with fresh eyes and log their first responses to get the color and material choices they really want. The human brain does its best color work intuitively. When our minds are relaxed, our sensory awareness is fresh. In the first 20 seconds of seeing a color, we can identify it accurately. Spending time reasoning about what we think we see only causes confusion — which to our rods and cones is the visual equivalent of gray. First impressions are therefore best when looking at a color and making a judgment about its light qualities. Artists learn on location to use the brain’s first, and best, analysis of light conditions. You can learn this habit of being sensitive to color nuances and bring light into your home. But before zip-lining to any color conclusions, you’ll want to use a little site analysis to guide your path. Look at the natural light that illuminates the rooms for which you are devising a color plan. Identify the orientation and the amount of light available during the time of day each space will be used. A kitchen that receives eastern light will have a soft, sunny glow at breakfast but will need some help to be a positive family gathering spot in the late afternoon when dinner is being prepared. A light wall color that has a yellow or an orange tinge can give the room a sunlit glow at the end of the day. Acknowledging the pluses and minuses of the room’s light conditions will help you narrow down your color choices. How light bounces off walls, countertops and floors is another condition to note before making color selections. If a black honed-granite countertop is draining light from your kitchen, the walls and floor will need to be pressed into service to amplify the sunlight. You might choose a warm yellow floor to step in for the sunlight being extracted from the room. Light-colored cabinets also can send natural light where you need it. Knowing how to interpret your family’s need for heat and light is a color basic for any room. Is there enough warmth in a north room to study in the afternoon when homework is happening? Does the southern-exposed living room of your summer house receive too much sunlight to offer a refuge from the beach during the day? Is there foliage outside the windows that will block the light when you plan to use the room? Visual color cues can make us feel warm or cold. You can use color to adjust the balance. Warm colors, such as yellow, orange and red, mimic sunlight and fire, and raise our blood pressure and body temperature. Cool colors, such as blue-gray, cool greens, white and black remind us of stone, snow, ice and water. A living room that gets plenty of warm, south-facing light with zero tree shade can be tricky. 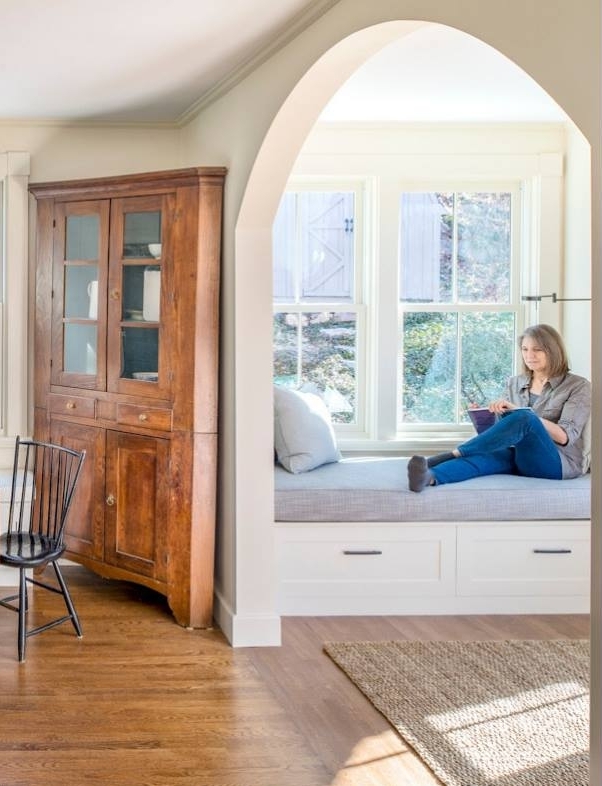 Cooling the walls with gray and white softens the sunlight, diminishing the glare and the oversupply of high energy, to encourage quiet conversation and reading. Once you have established the requirements for natural light and its availability in your rooms, gather samples of colors you think you might like for each room. You can order these online from many paint and flooring companies. Be sure the samples are large (at least 6 by 9 inches), and multiples are a must. You can tape paint samples on the wall with painter’s tape affixed to the back; place flooring samples at the baseboard’s edge. Never try to make a decision about any material for your home without first sampling it onsite. Color is not static; it changes as it interacts with the available light and other colors in the room. I tell clients and students searching for color ideas to try a trick that many landscape painters use to make swift judgments about color. Think about the “taste” you are trying to achieve, as you might while deciding what you want to snack on. Are you craving something salty or sweet or perhaps a little tart? By trying to interpret a color through a sense other than vision, your perceptions are heightened naturally. This is called synesthesia. Try tasting your way to ideas about color — and order more samples than you could possibly use. Be sure to sample some of the colors recommended by family, friends and showroom displays. Now is your chance to explore ideas that you have discussed and dreamed about. Though it is your frontal vision that “sees” color, the ability to look at color choices obliquely is a trick of the trade. Move around the room as you assess your samples and pick one or two that you think work. The choices will be obvious if you do not stand in one place, rigidly questioning your ability to decide what is best. This is where speed helps you get the result you want. You’ve done the work of light assessment required to make good color choices. Now let yourself use your intuitive knowledge to create the home that you and your family desire. Edit out the samples that do not satisfy and then choose from the remaining two. There is no one right answer. This part of the color process is fun and can be done in a snap. Let yourself tap into your innate understanding of what makes a habitat satisfying. From your lifetime of experience, the information you need to make a choice of color that fits your requirements is preprogrammed, just ready to be put into play.